Vattenfall placed one of its 8.8-megawatt turbines at the European Offshore Wind Deployment Center. It's an important milestone for a project that faced years of legal challenges from Donald Trump. Before becoming president, Trump battled the project because it conflicted with a planned golf course development in the area. At the time, his organization said it “will completely destroy the bucolic Aberdeen Bay.” The U.K.’s Supreme Court struck down Trump’s challenge in 2015. Turbines, offshore and onshore, will just keep getting bigger. The MHI Vestas turbines have a tip height of 191 meters and 80-meter-long blades. Looking beyond 2020, MAKE projects the U.K. market will lead offshore turbine capacity growth, with the average rating nearing 12 megawatts by the end of 2024. With an installed capacity of 93.2 megawatts, Vattenfall said the entire facility will produce 312 gigawatt-hours per year, enough to power nearly 80,000 homes and meet 23 percent of Aberdeen’s total electricity demand. It will displace 134,128 metric tons of carbon dioxide. 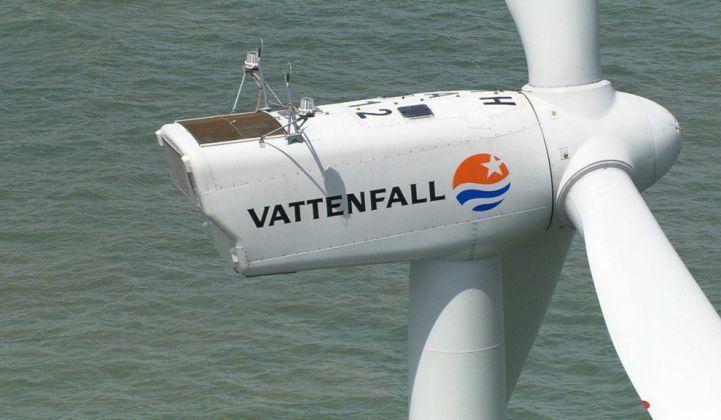 Vattenfall has a goal to excise fossil fuels from its portfolio within one generation. The European Union threw €40 million (about $49.3 million) behind the plant. The announcement out of Scotland comes just days after Interior Secretary Ryan Zinke proposed offshore wind lease sales for 390,000 acres off the coast of Massachusetts. Those sales are part of the “America-First Offshore Energy Strategy” executive order that Trump signed last April. “The Trump administration supports an all-of-the-above energy policy and using every tool available to achieve American energy dominance,” said Zinke when announcing the proposed wind sales. The 2017 executive order was meant to overturn an Obama directive that closed parts of the Arctic and Atlantic oceans to oil and gas exploration. It’s now facing court challenges over whether Trump has the authority to overturn Obama’s protections. The Europeans are taking a different approach to offshore energy development. “The EOWDC, through its innovative approach to cost reduction and pioneering technologies, leads the industry drive toward generating clean and competitive wind energy power — one that will reinforce Scotland’s global energy status,” said Gunnar Groebler of Vattenfall's wind unit.